Whether you’re getting ready to sell your home or you’re looking to make improvements to enjoy for years to come, there are certain projects that make more sense than others when it comes to getting the most bang for your buck. It’s never easy to prioritize these projects, but according to a 2014 survey of residential landscape architecture projects, there are a few outdoor improvements that stand out from the rest. Solar lighting and low-cost LEDs make brightening up your outdoor space a very reasonably priced endeavor. And just adding a little light to the exterior of your home can really make it shine (literally!). Everybody wants a great outdoor space to relax, entertain, and enjoy. So when it comes to highly rated outdoor projects, it’s no surprise that decks, patios and terraces were near the top of the list. Installing a great deck or patio doesn’t just give you an awesome space to use, but can also seriously boost the resale value of your home if and when you decide it’s time for an upgrade. 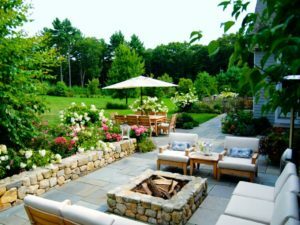 Having a lush, green lawn seems like it’s always been part of the American dream, but a well landscaped lawn has been jumping up in the ranks of outdoor improvement jobs. Lower maintenance landscaping is especially popular, including trees, native plants, and retaining walls that don’t require a lot of upkeep. Quality landscaping can also up your home’s value significantly and has been shown to cut the time a home spends on the market. There’s nothing quite like a cozy fire in the winter, but in the summer building a fire indoors can wreak havoc on your cooling bills. Enter the outdoor fire pit – these increasingly popular additions can be a great way to enjoy even the coolest spring and fall evenings in the peaceful setting of your beautiful yard. And with DIY kits available in the mainstream, you can even build your own outdoor fireplace in almost no time at all! 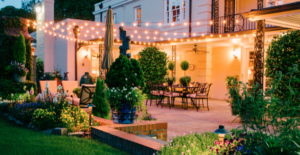 Number five on the list of most popular yard improvement projects requires a few pre-requisites – namely that you already have some kind of functional outdoor space like a deck or patio. If that’s the case, adding built-in seating can drastically up the usability of your outdoor space by creating more functional areas for your family and guests to enjoy. The survey also found that other popular projects include fencing, eco-friendly irrigation systems, pergolas, and water features. So if you’re looking for some ways to spruce up the green space around your home, there are plenty of great options available to you. This entry was posted on Sunday, April 2nd, 2017	at 10:53 am	. Both comments and pings are currently closed.